Florentine painter and architect. Outstanding as a painter, sculptor, and architect, Giotto was recognized as the first genius of art in the Italian Renaissance. 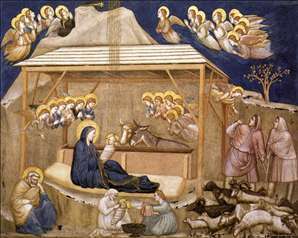 Giotto lived and worked at a time when people s minds and talents were first being freed from the shackles of medieval restraint. He dealt largely in the traditional religious subjects, but he gave these subjects an earthly, full-blooded life and force. The artist s full name was Giotto di Bondone. He was born about 1266 in the village of Vespignano, near Florence. His father was a small landed farmer. Giorgio Vasari, one of Giotto s first biographers, tells how Cimabue, a well-known Florentine painter, discovered Giotto s talents. Cimabue supposedly saw the 12-year-old boy sketching one of his father s sheep on a flat rock and was so impressed with his talent that he persuaded the father to let Giotto become his pupil. Another story is that Giotto, while apprenticed to a wool merchant in Florence, frequented Cimabue s studio so much that he was finally allowed to study painting. 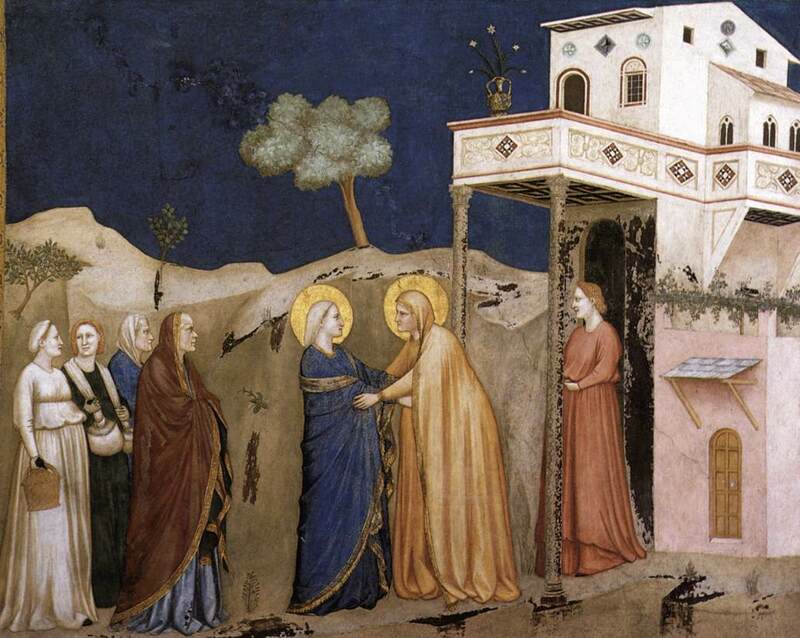 In Rome, Naples, and Florence, Giotto executed commissions from princes and high churchmen. 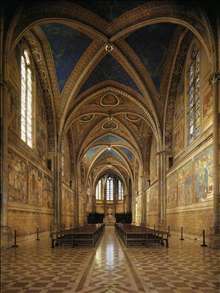 The Peruzzi and Bardi chapels in the Church of Santa Croce are adorned by Giotto s frescoes. Giotto is regarded as the founder of the central tradition of Western painting because his work broke free from the stylizations of Byzantine art, introducing new ideals of naturalism and creating a convincing sense of pictorial space. His momentous achievement was recognized by his contemporaries (Dante praised him in a famous passage of The Divine Comedy, where he said he had surpassed his master Cimabue), and in about 1400 Cennino Cennini wrote Giotto translated the art of painting from Greek to Latin. In spite of his fame and the demand for his services, no surviving painting is documented as being by him. 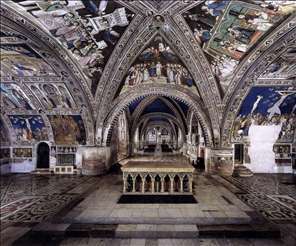 His work, indeed, poses some formidable problems of attribution, but it is universally agreed that the fresco cycle in the Arena Chapel at Padua is by Giotto, and it forms the starting-point for any consideration of his work. 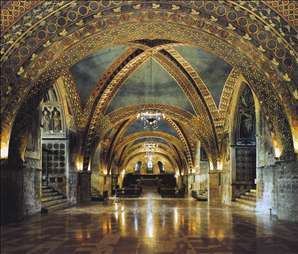 The Arena Chapel (so-called because it occupies the site of a Roman arena) was built by Enrico Scrovegni in expiation for the sins of his father, a notorious usurer mentioned by Dante. It was begun in 1303 and Giotto s frescos are usually dated c. 1305-06. They run right round the interior of the building; the west wall is covered with a Last Judgment, there is an Annunciation over the chancel arch, and the main wall areas have three tiers of paintings representing scenes from the life of the Virgin and her parents, St Anne and St Joachim, and events from the Passion of Christ. Below these scenes are figures personifying Virtues and Vices, painted to simulate stone reliefs - the first grisailles. 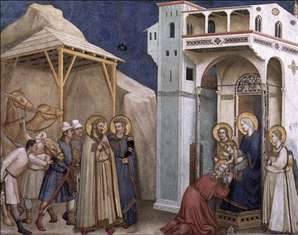 The figures in the main narrative scenes are about half-size, but in reproduction they usually look bigger because Giotto s conception is so grand and powerful. His figures have a completely new sense of three-dimensionality and physical presence, and in portraying the sacred events he creates a feeling of moral weight rather than divine splendor. He seems to base the representations upon personal experience, and no artist has surpassed his ability to go straight to the heart of a story and express its essence with gestures and expressions of unerring conviction. 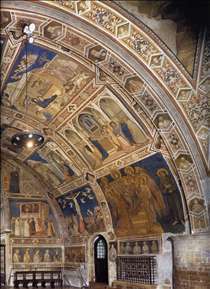 The other major fresco cycle associated with Giotto s name is that on the Life of St Francis in the Upper Church of S. Francesco at Assisi. Whether Giotto painted this is not only the central problem facing scholars of his work, but also one of the most controversial issues in the history of art. 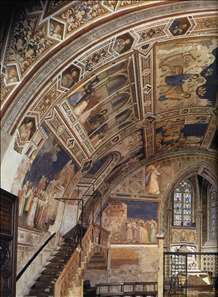 The St Francis frescos are clearly the work of an artist of great stature (their intimate and humane portrayals have done much to determine posterity s mental image of the saint), but the stylistic differences between these works and the Arena Chapel frescos seem to many critics so pronounced that they cannot accept a common authorship. 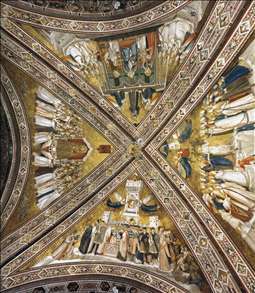 Attempts to attribute other frescos at Assisi to Giotto have met with no less controversy. Nothing survives of Giotto s work done for Robert of Anjou in Naples, and the huge mosaic of the Ship of the Church (the Navicella) that he designed for Old St Peter s in Rome has been so thoroughly altered that it tells us nothing about his style. In Rome he would have seen the work of Pietro Cavallini, which was as important an influence on him as that of his master Cimabue. 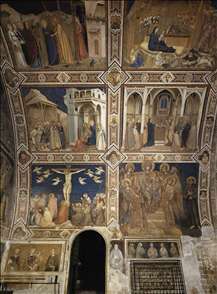 Several panel paintings bear Giotto s signature, notably the Stefaneschi Altarpiece (Vatican), done for Cardinal Stefaneschi, who also commissioned the Navicella, but it is generally agreed that the signature is a trademark showing that the works came from Giotto s shop rather than an indication of his personal workmanship. On the other hand, the Ognissanti Madonna (Uffizi, Florence, c. 1305-10) is neither signed nor firmly documented, but is a work of such grandeur and humanity that it is universally accepted as Giotto s.
See more details about "View of the choir of towards the west"
See more details about "Panoramic view of the frescoes"
See more details about "View of the north transept (1)"
See more details about "View of the north transept (2)"
See more details about "Vault of the north transept (3)"
See more details about "Franciscan Allegories"
See more details about "View of the interior"